The first men ashore on "D" day were frogmen; this time they were called Landing Craft Obstruction Clearance Units [LCOCUs pronounced Lock-yews]. There were a hundred and twenty of them and their object was to clear away the underwater obstructions and mines so that the assault craft could get on to the beach. 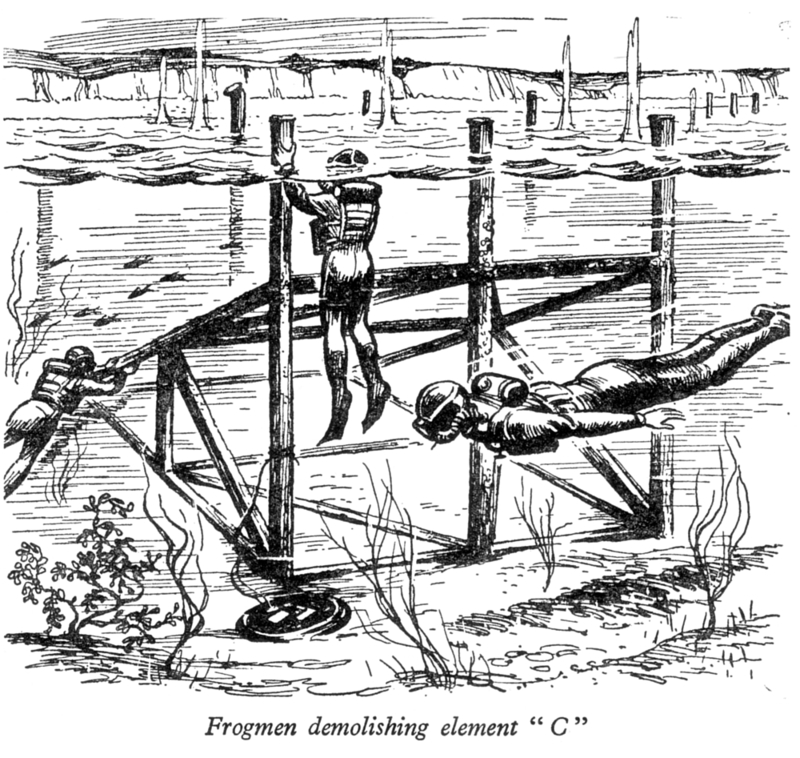 The frogmen who blasted a hole in the Nazis' Atlantic Wall, and enabled invasion craft to reach the Normandy beaches on "D" day were nearly all "hostilities only" men. The men who led the units were Lt. R. E. Billington, D.S.C. and Bar, R.N.V.R., aged 28, of Purley; Lt. H. Hargreaves, D.S.C., aged 21, a cotton salesman from Burnley; Lt. J. B. Taylor, D.S.C., R.N.V.R., aged 22, a Middlesex bank clerk; Lt. W. Brewster, D.S.C., R.N.V.R., aged 28, an Edinburgh bank clerk; Capt. A. B. Jackson, Royal Marines, a Dumfries bank cashier; C.S.M., D. J. R. Morss, R.M., a carpenter's mate from Herne Hill; Lt. D. J. Cogger, M.C., R.M., an engineer­ing apprentice from Canterbury; Sgt. P. H. Jones, D.S.M., R.M., a carpenter from Bournemouth; Lt. D. J. Smith, R.M., an assistant engineer from Purley, and Sgt. K. Briggs, D.S.M., R.M., from Dorking. Hargreaves, Billington, Taylor, Briggs and Jones received their decorations for the Normandy invasion operation. Four others who were decorated were P.O. S. C. Eagles. D.S.M., a costing clerk from Manchester; P.O. F. Livingstone, D.S.M., a Hull carpenter; Cpl. E. Deans, D.S.M., a motor driver from Barrow-in-Furness, and Cpl. R. Headley, a Newcastle-on-Tyne apprentice engineer. So there you have them - bank clerks, engineers, carpenters, clerks and students. Some of them had previously served in midget submarines and the human torpedoes. All of these bank clerks, engineers, carpenters, clerks and students acquitted themselves nobly on "D" day. A long time before the invasion of Normandy it had become apparent to us that the much vaunted Western Wall of the enemy extended not only to the shores of Europe but beyond them, and into the sea. This extension of the wall consisted of formidable obstacles laid right down to the low-water line in such a manner that they would soon be covered by a rising tide. The most formidable of these obstacles was known as Element "C". It was a two-and-a-half-ton mass of steel, constructed like a picket fence. It was ten feet high by ten feet broad and on a base which measured ten feet by fourteen feet. This had to be scientifically destroyed, because if it had been merely blown up carelessly it would still have been a formidable obstacle. Thirty-six small charges were placed at different positions on the obstruction and when they were all exploded it fell to pieces, and no part of it was more than eighteen inches above the sea bottom. There were metal objects standing some five feet high in the form of pyramids. There were other steel obstacles known as "Hedgehogs" which looked like a six-pointed star. Every one of these devices was festooned with mines or shells so that even the lightest touch of an invasion craft would have set them off. In any case, even if the mine or shell had not exploded, the obstacles themselves would have ripped the bottom out of any craft which touched it, and rendered it useless, or even sunk it on the spot. 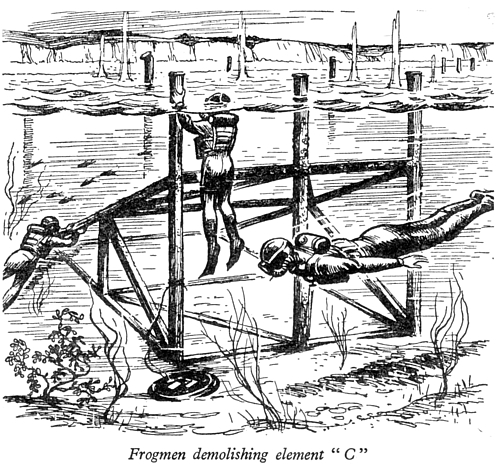 This then was the task of these frogmen, the task for which they had been training since the Landing Craft Obstruction Clearance Units had been started in January 1944 at H.M.S. Appledore in the little village of Appledore on the North Devon Coast. In charge of the training units was Lt.Commander Davis, R.N.R., of Hereford, formerly of the Boom Defence Com­mandos from which the Locku Boys developed. With him was Chief Petty Officer D. P. Reid, an Appledore man and former merchant service bos'n, who put every one of the men through their underwater swimming tests, and was responsible, in all, for about twenty thousand dives. "The invasion of Normandy to the average person was the greatest combined operation that had ever taken place, and that in fact was the truth. However, few people know of the work carried out by small, special units, both before the operation, and during the initial assaults. We were one of the small units which had this particular role to play. A role which was not easy, and from which many of us did not expect to return, but one which we were determined to carry out until our work was completed. For the invasion of Normandy the Force Commanders used approximately a hundred and twenty officers and men of the Locku units divided into ten parties, or units. Each unit had an officer and eleven men, and each was allotted to its own beach and had its own particular job to do. In my case, and that of a brother officer, we found ourselves detailed to deal with the obstacles on a beach near the village of La Riviere. "We were supposed to go in at H hour, which was the very beginning of the assault. We were dropped into our craft from an L.S.I. at seven o'clock in the morning and went hell-for-leather for the beach, and arrived hoping to find the front row of obstacles on the water's edge, and not in the water, but discovered some two or three feet of water over them. We left our craft and got to work at once on posts with mines secured to the tops of them, specially constructed wooden ramps which were mined, and steel hedgehogs with mines and anti-aircraft shells on top of them, and we were subjected the whole time to quite a hot fire from rockets, shells and bombs. "We must have been about four hundred yards from the beach when the firing first started, and they didn't forget to inform us that they knew we were coming. When we finally got on the beach we discovered that we were being systematically sniped, not only with rifles but also by odd bursts of machine-gun fire - a most unpleasant experience - but one that we soon got used to. As time went on we almost forgot about it until we realised that opposition was dying down because in the meantime the Army had landed and was dealing with machine-gun posts, mortar posts, and all the other unpleasant places Jerry had prepared for us. "The weather was very much worse than anyone would have expected in June, and we had the greatest difficulty working in a very heavy surf. It was hard going and we soon got pretty tired, but in the meantime the obstacles were being slowly but systematically destroyed. As we made an initial gap for the landing craft to come through, so we increased the size of the gap as time went on. We succeeded in clearing the whole of the beach some thousand yards in length, with obstacles going out to over four hundred yards by the end of "D" day. "That didn't end our work, of course, although the worst was over. Landing craft of all shapes and sizes were simply pouring on to the beach, and in the meantime, having cleared that beach, we had to proceed to another beach and get rid of the obstacles there. In all, we successfully disposed of over two thousand five hundred obstacles, practically every one mined, in addition to this, as a sort of savoury, we cleared the explosives out of half a dozen beetle tanks. "Not long before 'D' day a special jacket had been invented to protect us against that terrible blast which can be experienced when a mine or shell explodes underwater. This jacket was known as a 'Kapok Jacket' and was worn underneath our swim suits. It proved to be a most wonderful thing, and saved the lives of no less than three of my men. One of my petty officers, who was working in about six feet of water, had a shell or mortar bomb explode in the water quite close to him, and although he was completely knocked out, and in fact paralysed for several hours, he had no injuries whatever, and no after effects. A Royal Engineer who was swimming towards the beach from one of the landing craft, and was some distance farther away from the explosion than the petty officer, was killed outright, and I have no doubt that many men suffered the same fate on that day. "I would like to make it quite clear that we don't in any way look upon ourselves as supermen, or heroes, or anything like that at all, and we did not by any means clear all the obstacles off the beaches in time for the landing craft to get in. There were nowhere near enough of us to have hoped to do it. What we could, and did do, was to clear an initial gap for the landing craft to beach safely, and to increase that gap as quickly as possible until the beach was entirely free from obstacles. "Consequently many of the landing craft who didn't use the gap, because of the simple fact that there just wasn't room for them, struck obstacles, or had holes blown in them or their bottoms torn out, with the result that many men had to swim ashore with full equipment. "When our original job had been completed we had to keep our reputation as 'Jack the Handyman' by doing many jobs to assist on the beaches, such as winching drowned vehicles out of the water. We did this by taking a wire with a hook on the end, right out to sea in our swim suits and breathing sets, hook up the vehicle, come to the surface and signal to the operator ashore to start up his winch, which he did, and pulled the drowned vehicle up high and dry. We helped to unload stores, we cleared mines, we assisted the Royal Engineers, in fact we did everything except mind the babies, and if there had been any there we would have done that too. "Throughout the landings, in all ten units, the total casualties were two frogmen killed and ten wounded - some seriously. Lt. Hargreaves was wounded in the shoulder, but carried on. One of the coolest pieces of work was done by Sgt. K. Briggs, D.S.M., R.M., who, although he was being sniped at all the time, rendered a hundred charges safe, single-handed. "We were spotted from a tower ashore and were subjected to pretty heavy mortar fire during which a petty officer was killed and two men were wounded. Later the R.A.F. blotted out the tower and things were more comfortable although shells still kept coming over. One shell destroyed our breathing apparatus, which we had not been using as the tide was low. When the water came up later, Leading Seaman A. Robertson and myself tried staying underwater by holding our breath. We blew about fifteen obstacles in this way, but we couldn't keep it up. We carried on next morning, after sleeping in a R.A.F. crater, where incidentally we were subjected to fire from an 88mm gun. "This party became short of food and an expedition went into the shattered town to forage. "We found a chicken," said Lt. Rumsey, "which was very difficult to catch, and even more difficult to kill. We also found some black bread and some German spam. I don't know if it was because I was so hungry, but that spam tasted better than any we ever had at home." I was proud to be a friend of the Petty Officer who, thanks to his Kapok Jacket, survived the explosion in the water "quite close to him". He eventually became staunch MCDOA founder member Lt Cdr Robbie Robinson MBE RN who suffered pain from his injuries right up to his death in March 2004. He is the type of man the Vernon Monument will be celebrating and one of the reasons I am so passionate to see it erected. For a description of minesweeping activity during the Normandy landings, see the entry for 26 May 04 in News Archive 6 and Operation Neptune: the Minesweeping Operation 5-6 June 1944 by David Verghese in the website's Dit Box.